« So Can We Really Not Hold Two Ideas In Our Heads Simultaneously? There is one thing that activists can never, ever do: declare victory and go out of business. For activists, their chosen problem is always worse than ever and continuing to go downhill. Drawing on findings from 20 years of research on sexism in American classrooms, this book examines the history of women's education and its shortcomings. The hidden curriculum, the effect of gender bias on self-esteem, test results, and professional orientation of girls from primary education through college were examined through naturalistic observation. The results suggest that girls are systematically denied opportunities in areas where boys are encouraged to excel, often by well-meaning teachers who are unaware that they are transmitting sexist values. Girls are taught to speak quietly, to defer to boys, to avoid math and science, and to value neatness over innovation, appearance over intelligence. In the early grades, girls, brimming with intelligence and potential, routinely outperform boys on achievement tests, but by the time they graduate from high school they lag far behind boys--a process of degeneration that continues into adulthood. It takes some work to look at this situation and decide that the main issue you want to highlight is how girls are getting hosed. But trust an activist to be up to the task. 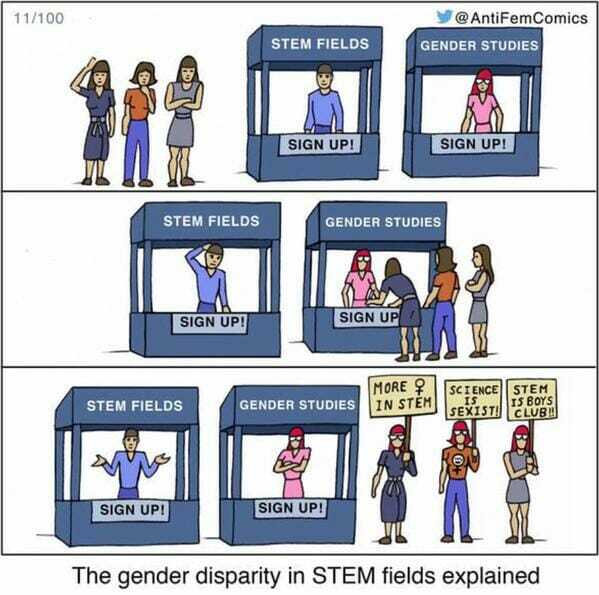 There is truth to your cartoon, except Mark Perry also frequently shows that STEM fields are almost completely dominated by women. The only three aren't are EE, Mechanical E. and Computer Science. The others, medical, biological, chemical, math sciences are all completely dominated by women. All the fuss is because women think there should be more computer scientists among women, not that they don't represent STEM. Basically the feminist movement wants everything. With the exception of biomedical engineer I would say all of engineering is pretty male heavy. However, your point is correct and genderists intentionally or otherwise, don't really seem to understand. Biology and chemistry is very female heavy. 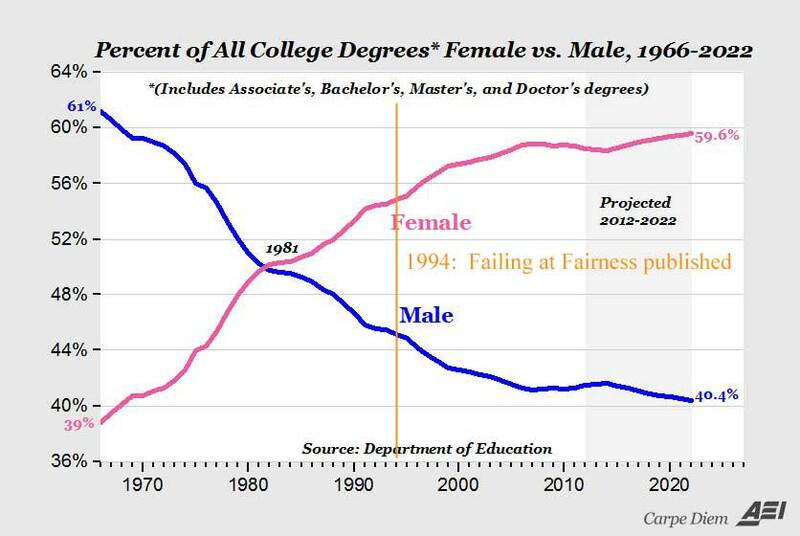 If they really want a better spread, try to convince girls doing bio or chem to switch to engineering, physics, etc. As a software developer I follow this issue a bit and while I believe that a little bit of diversity can be good, I'm still far from convinced that it reflecting the population at large has benefits. Convincing individuals to pursue a particular career that they don't have interest in otherwise seems an odd strategy. I'm glad no one was trying to twist my arm as a male to become a elementary school teacher to help achieve better balance. We better get on that evil disparity. Methinks that the SD School of Mines and Technology is an illustration of the gender balance in STEM. For decades the students and the school have wanted more females, but the last I heard, female attendance was actually going down. I can't find it on Google, but I remember Mark showing all the major Stem Fields, and their female representation, and there were only a few as I mentioned. I did find this though. Also I should point out as a computer programmer, is it all works, not because we are diverse and think all different, but that we all learned to think the same and have the same basic knowledge base to draw from. But I agree with you, forcing people to take an interest in something they don't like is a recipe for their failure. but this is for doctorates. women most definitely do not get the majority of degrees in math, physics, or engineering as a whole. but med and bio, yes. My memory definitely failed me - there are definitely more men than women in engineering, by a long shot. I swear though MP had a bar graph breaking it out, rather than a percent table. Alynski literaly wrote the book for activists: "Rules for Radicals." One of his rules is to keep coming up with new causes in order to maintain and/or gain power.